BOULDER, Colorado – September 17, 2017 – As children head back to school and daycare, parents know their kids will come home with more than homework. They’ll also bring an onslaught of colds, strep throat, pink eye, stomach flu, and diarrhea. It’s that last one that is a real pain in the you-know-what as up until now, parents have had few options to effectively treat it. Now there’s a solution that keeps kids in school and parents at work. 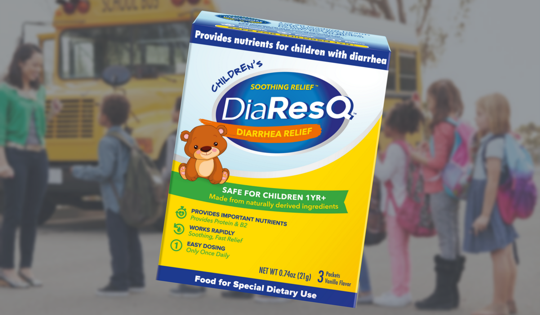 Children’s DiaResQ® provides fast relief from diarrhea; one dose provides important nutrients to help kids fight “the runs”, minimizing time from school and work waiting for diarrhea to runs its course. Although parents sometimes shy away from the “D word,” diarrhea is extremely common in children, says Dr. Alan Greene, a pioneering pediatrician, best-selling author, TEDx speaker, and advocate for improving children’s health around the world. Greene says parents shouldn’t ignore the pervasive nature of diarrhea. “There are 1.5 million diarrhea-related doctor visits a year among American kids. By the time a child is age five, they have experienced up to 15 bouts of diarrhea. Though the condition is rarely serious, waiting for stomachs to settle and diarrhea to subside means plenty of lost time at school and work,” said Greene, who also serves as DiaResQ’s chief pediatric advisor. Being prepared for the worst is often the best defense. Until recently, Children’s DiaResQ was available mainly through online retailers Amazon.com and Target.com along with 250 Passport Health Clinics across the country. Children’s DiaResQ is now available at CVS Pharmacy locations nationwide, making it easier than ever to purchase the new back-to-school essential. It is also available at regional grocery chains Meijer, Albertson’s, Wegman’s and more. As the first true innovation in its category in 40 years, DiaResQ for adults and children are rapidly being added to retail shelves. In addition to the drugstore chain, Albertsons, Meijer, Safeway, Wegmans, and others now carry DiaResQ. A complete list of where to purchase DiaResQ is available here. Additional retail and outlets are pending.